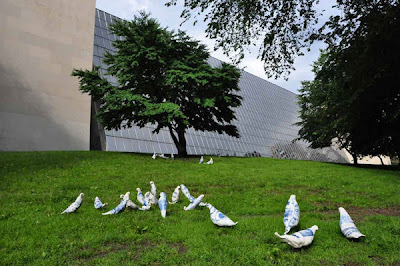 “Birds in the Park” is a touring public project, which involves the one-day installation of thirty to sixty porcelain birdlike forms on the ground. Originating with the shock and dismay I felt as the US government began the war with Iraq, and expanding to consider the phenomenon of war in general, the questions posed by the birds are about the humanness of us all. How we are connected, and also the unthinkable ways in which that bond is disregarded. More specifically, I’m layering, and in some cases placing side by side, silk-screened images of children playing, love letters, poetry, recipes and prose… with silk-screened newspaper articles and photographs of the lead-up to and beginning of the current Iraq war, as well as other war-related documents, that tend to bring up the question, How can people do that to each other?! Among other things, I'm looking at how the initiation of a war is “sold” to regular people. Also, how discussions about the cold facts of war, weapons capabilities etc. can become detached from the human reality on the other end, creeping into everyday life as something normal, like birds in the park. This work draws on years of experimentation with silk-screen printing onto clay. I create the silk screens from photographs and documents, and use them to apply the image and text onto wet porcelain. While the clay is still flexible, I form the birds -- each one is different -- and eventually fire them at a very high temperature. The forms themselves are about a foot and a half each in length. Low to the ground, some are involved in their own search, while many appear to be in conversation with each other. Although they are made from porcelain, the pieces are actually quite sturdy. They are positioned in such a way that people can wander among them, taking time to look and read. I set them up in the morning and take them down at night. It’s out of the blue and somewhat fleeting, the better to catch the unsuspecting passerby’s curiosity. An important part of the project is the actual interaction with people, and I as the artist am always present during an installation, to answer questions, listen and converse. 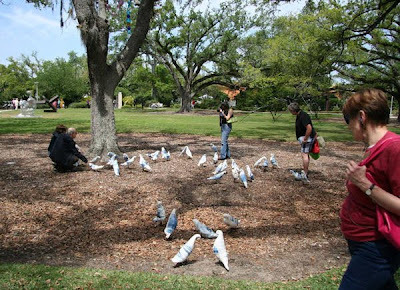 The project began in Santa Fe, New Mexico, where in the spring of 2009 the birds landed in about thirty locations; places like the farmer's market, City Hall, various parks, cafes and libraries. Later, the birds began to fly farther afield, landing along the coast of California, in Central Park, NY, in a sculpture garden in New Orleans, at a University Plaza in Germany, in front of Chartres Cathedral in France, and even migrating so far as the Galapagos islands. New birds continue to be born, often in response to the places that the birds have been or will be visiting. 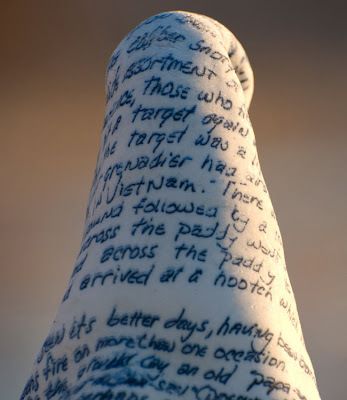 In addition to personal photography and images and text borrowed from public media, I am collaborating with writer and Vietnam War veteran Tim Origer, English poet Henry Shukman, Venezuelan photographer Maria de Las Casas, and my father Werner Hengst for some of the material that appears on the birds. One landing scheduled for July, 2010 is in Peenemünde, Germany, the site of the V-1 and V-2 rocket development during WWII; my grandfather was working there as a scientist then, and photographs of the lab town before and after its bombing, as well as quotes from Germans during that time, are making their way into some of the silkscreened images on the birds now. The flight pattern continues to develop, and the project is expected to continue through fall 2010. Thursday, March 18th, on the center of the Mall at 9th street. Friday, March 19th, Dupont Circle. Sunday, March 21st, Upper Senate Park, by the Capitol. For pictures and location information, visit her website here. Past updates about the birds' travels can be found at www.birdsinthepark.blogspot.com.